We finally had the opportunity to go to an authentic Mexican restaurant. We went to El Tapatio and it is located directly across from the Hy-vee on Gordon Drive. I have driven past this restaurant hundreds of times, but have never gone their to eat for no specific reason. As of late, I have been hearing about their $1 draft beer special on Wednesday’s, which was luckily the day Dr. Elder chose for us to go to El Tapatio. Walking in, I immediately knew it was a Mexican restaurant. The walls and decor not only gave you the feel that you were in Mexico, but the music playing in the background did as well. We were the first ones in the restaurant for the lunch hour and soon after we were seated, more and more people began filling the place. The menu was very similar to most restaurants like it in the area and had a large list of lunch specials. I first ordered a strawberry margarita to quench my first on the hot Wednesday, and then placed my order for a steak fajita. My margarita came out in a timely manner and was nice and large. Although I didn’t taste much tequila in it, the strawberry flavoring was delicious, so I wasn’t too disappointed. There were chips and salsa on our table, so we got an order of cheese dip to go along with. The queso was warm and was a nice addition to the chips and salsa appetizer. The place was busy for lunch, so our waitress wasn’t able to refill our basket of chips for awhile, but that was fine because then we couldn’t get too full before our meals came out. 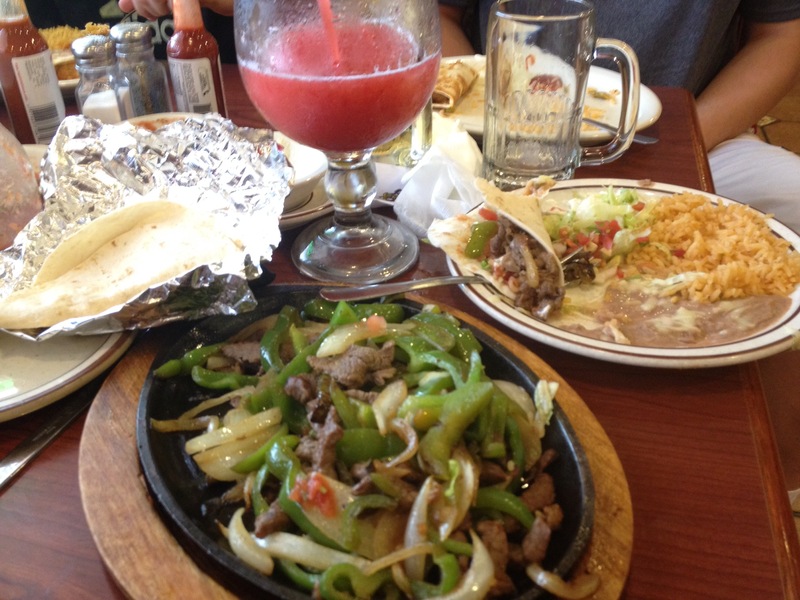 I could hear my fajita still sizzling on a hot plate as it was being carried from the kitchen to my table. I barely had any room on the table to put the hot plate, the plate of rice and beans, and the plate of tortillas. Steam was still rising from my plate, so it was also visually pretty hot. There was only one thing for me to do, dig in. I started grabbing my tortillas and first put beans in rice inside, followed by the peppers, onions, and steak strips. The meat was cooked well and the combination of all the foods together in a shell was delicious. I poured salsa on my fajitas to give them some spice and that was a good decision. It was a good thing my margarita had some size to it, because the hotness of the fajitas mixed with the salsa made me finish the margarita pretty quickly, so I had to try out the $1 beer special. The drinks were filling enough, but I also ate most of my food, so there was no way I was going to be able to eat any dessert this time. I enjoyed my lunch at El Tapatio. The atmosphere was fitting for the restaurant and set the tone for the rest of my lunch. The waitress could have been a little more helpful, but I doubt they were expecting as large of a crowd as they got at 11:00 am on a Wednesday, so I wasn’t mad at her. They did a great job making my drinks and food, and I left the restaurant both full and satisfied. I will be coming back to get more margaritas and food soon.